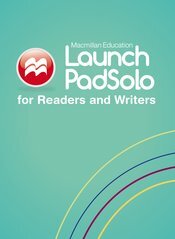 By combining formative and summative assessments with opportunities to study, practice, and review specific skills, LaunchPad Solo for Readers and Writers provides instructors with a quick and flexible solution for targeting instruction on critical reading, the writing process, grammar, mechanics, style, and punctuation based on students’ unique needs. Students will gain confidence by working through sequenced units that guide them from concept to mastery. At home or in class, students learn at their own pace, with instruction tailored to individual learners.